In any case, these things are fun to collect, and there's always something new to discover. This photo shows a non-articulated Barada, which I was told came from Poland. Its molded entirely in a dark shade of brown and is embellished with some painted details. 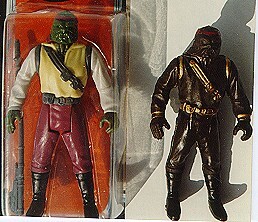 It terms of mold detail, its basically just a solid copy of the regular Barada figure.